On the grass verge outside 52 Helston Rd, opposite the old folks home. 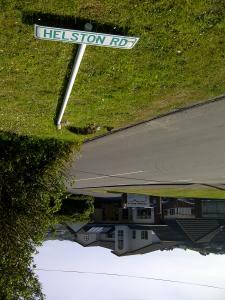 Some toe-rag has pulled down the street name sign for helston Road, that would normally face drivers waiting facing East at the end of Petherick Cres to onto Helston. Repair crew will need post bending equipment and concrete mix.